Laban Norton Matteson born May 31, 1812 Arlington, Bennington Co. Vt. m. Clarissa Daniels born Dec 2, 1816 in Williamstown, Berkshire County, Mass. on August 28, 1836 in New Labenon, NY by Ira Hand the Justice of Peace. Clarissa is the daughter of Johnson Daniels and Rhoda King. Johnson Daniels is the son of Starling Daniels Rev. War Vet. in Mass. Laban Norton Matteson is in the 1840 census of Arlington, Bennington County Vermont. In 1850 he is in Stamford, Bennington County Vermont. In 1860 he is still there. Two sons Albert Norton Matteson and Oscar Johnson Matteson enlist in the Civil War from Stamford. Albert's papers were signed by Laban. Two girls die in Vermont. Rhoda Clamana Matteson is buried in Arlington in 1842. Martha A. Matteson is buried in Stamford in 1855. 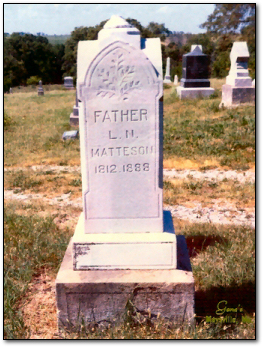 Laban Matteson is buried in Greystone Cemetery, Maysville, Dekalb County Missouri. Albert Norton Matteson born Dec 23, 1846 in New Adams, Mass. Civil War Vet, died Feb 17, 1906 in Kansas City, Kansas married twice. has children.